Eva Hermann was born in the year 1900 and raised at the house of a protestant priest. 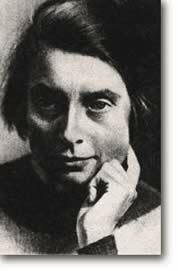 She was a teacher and in 1924 she got married to the physicist Carl Hermann. Both were pacifists and in 1933 they affiliated to the Quakers in Mannheim. Eva Hermann ran there an advisory service of Quakers for the ”non-Arian” without confession and helped them to emigrate from Germany. In 1940, after the deportation of Jews from Mannheim to Gurs, she sent them packages to the French admission camp. To other Jews who stayed at Mannheim she helped them with food cards. In 1941 she contacted her Jewish partner from the school, Hilde Rosenthal, who then lived in Berlin and offered her assistance in case of an imminent deportation. To Hilde and her husband Fritz she sent food cards and documentation from the post office, that the latter passed to a Jewish friend. In January, 1943 the Rosenthal hid during a month at Eva and Carl Hermann´s house, who by then already had two little adoptive children. Both marriages had kept contact with the Gertrud Luckner support group. In March, 1943 the Rosenthal, who had moved in to Saarbruck, were arrested. Fritz Rosenthal committed suicide with cyanide, whereas Hilde was kept under interrogation before she was deported. As a result, Eva and Carl Hermann were also arrested. They were accused of having listened ”enemy broadcastings”, which was strictly forbidden. In the report, the support to the Rosenthal was pushed into the background. Carl Hermann was condemned to and eight-year imprisonment, Eva Hermann to three. After the war Eva and Carl Hermann worked in favor of the Jewish – Catholic dialogue. Anton Maria Keim (Hrsg. ), Yad Vashem, Die Judenretter aus Deutschland, Mainz/München 1983, S.71. Angela Borgstedt, Widerstand gegen die Judenverfolgung, in: Portraits des Widerstands, Hrsg.v. Michael Kißener, Konstanz 1996, S. 227-259.